Its that time of the year again...time for me to show all three of my faithful blog readers just how truly un-fashionable I really am! Or time for my mom to be happy because she gets to see a picture of me everyday! Either way, I always love taking part in fashion week...meeting fellow bloggers, getting inspiration to get myself dressed, and the compliments...oh the compliments! If you so dare, I invite you to join in the fun. Head over to Emery's blog to participate and enjoy yourself. Just to give you a preview of what is to come. It has been raining every day and the temps are in the mid 30's, so I will be bundled up all this week with boots on my feet! Not too exciting, but I will try. Jeans: True Religion...that I got for free a few years ago! I really love that drapey style of sweater and the fact that you found a striped one makes it all the better! And WhAT??? FREE True Religion jeans?? That's pretty exciting. Can't wait to watch Fall show off in your Edinburgh pics this week! those boots look so cute and comfy! i love them! can't go wrong with black and white. you look great. Love the stripes! Comfortable and stylish always gets my vote! Your smile is just killer. Cute out fit on a super cute girl! Yea! I do enjoy getting a daily pic of you. Thank you. Love you! ooohhh, I love stripes, they look really good, like it so much! You look great and comfy! That is the only thing that matters when it's cold outside! I really like your boots, do you like them? How do they feel? I need to get some since it's starting to get cold where I am. I love that sweater, black and white stripes always look great! 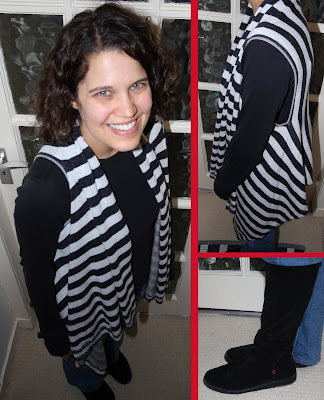 The drapiness of the vest, combined with the stripes, is wonderful. Oh boot season, how I love thee. Yours look soooo comfy. Beautiful! I too am all about comfort! that outfit looks so chill. i'd rock it. We-ell dont YOU just look darling in your little stripes! Unfashionable-funshmashionable... or something like that. You look styled and comfy, aka: the best combo. I love the stripes! You look great! Love the sweater. And if I've never mentioned it before I love your curly hair.